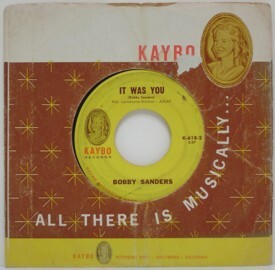 One of L.A.’s biggest 45s was from Seattle, namely the start of the recording career of Ron Holden & Thunderbirds began when Holden was arrested. “My band and myself were at a little high school sock hop. During the intermission, the boys in the band including myself went out. We jumped in our band car. We had probably a half pint of I.W. Harper and one of them funny little cigarettes. “It was about ten of us, stuck in this little car. The police came over, checked us out, found out I was the only one over 18. I did my little odd job for the government. While I was in there, I met the forensic expert, the guy who took fingerprints. “I told him I had just written a letter to my girlfriend explaining to her that I wasn’t a bad guy. Fingerprint guy turned out to be Larry Nelson who was about to quit law enforcement and start the Seattle-based Nite Owl label. Nelson’s partner, Chuck Markulis, who attended San Pedro High School and Everett Junior College in Washington and sang as the Shades on “Dear Lori” b/w “One Touch Of Heaven” on Aladdin (3453) in 1959. Markulis and Nelson shopped the song to L.A. labels and the Challenge label pressed up 5,000 45s, but then backed out. To avoid litigation, Challenge sent 5,000 unlabeled discs to Seattle. Nelson and Markulis glued Nite Owl labels on them one-by-one. 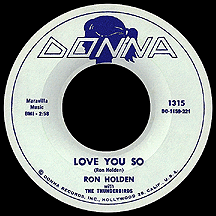 They then made a deal with Bob Keane who released “Love You So” b/w “My Babe” on Donna (1315), where it charted higher than it did in Seattle. It first charted on KFXM at #1 on February 13, 1960; at Wallichs Music City at #1 on March 14, 1960; on KRLA at #1 on March 18, 1960; Valley News chart at #1 on March 18, 1960; KFWB at #1 on March 26, 1960; KACY in Oxnard at #1 on April 3, 1960 and Billboard charts at #7 on April 4, 1960 and the Billboard R&B charts at #11 on May 16, 1960. In all, seven months (November 1959 to May 1960) of appearing on different charts. 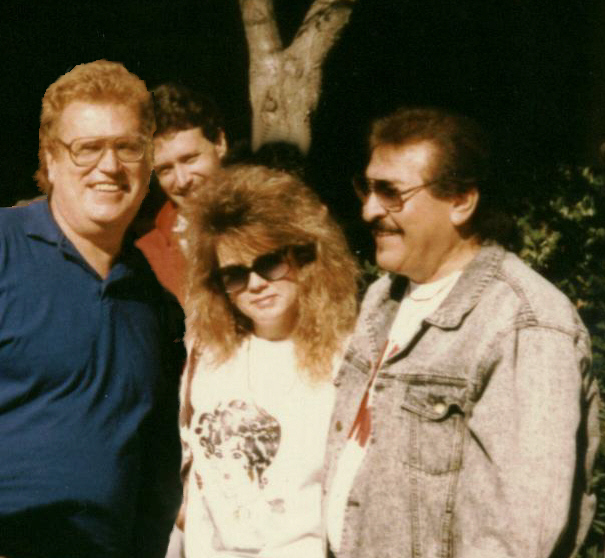 After singing with the Chargers, vocalist Jimmy Norman hooked up with H.B. Barnum, who had him record “Thank Him” and a remake of Hank Williams’ “You Win Again” on Mun-Rab (102), Barnum spelled backwards. In late 1959, Norman’s reference to the marketing ploy totally different from the T-Birds hit, “Green Stamps” was very much influenced by Sheb Wooley’s “Purple People Eater” complete with squeaky voices b/w a rocker, “Just To Get To You” on Dot (16016). Then came the T Birds. T-Bird was an example of creating a label to market master to more major label. “That was John Marascalco’s production and he had a lot of gimmicks,” Chaney recalled. “We were with my ex-wife’s cousin, he was faking guitar” on the record. “’Green Stamps’ is the title of this amusing record which tells about a boy who pledges to give his girl ‘green stamps, yellow stamps, blue chip, too’ every time she kisses him. He also urges her to ‘come an get ‘em’. “Throughout this rock’n’roll platter there is an outstanding similarity between the T-Birds’ style and that of the well-known Coasters. This style, the beat, lyrics and expressions used all combine to make this recording one that will probably do quite well on the surveys.” It did. “Green Stamps” did not chart nationally nor did the much rarer “Taco Harry” b/w “Hog Wild” (Chess 1792), which presaged the demise of the T-Birds. The same lineup also recorded as the Runaways on Lavender about six months later. In 2010, there were 3 new posts, growing the total archive of this blog to 30 posts. The busiest day of the year was September 10th with 86 views. The most popular post that day was About Rockin Steve. The top referring sites in 2010 were oldwax.blogspot.com, wpmd.org, en.wordpress.com, en.wikipedia.org, and search.aol.com. Some visitors came searching, mostly for evelyn freeman, john dolphin, huggy boy, jesse belvin, and ed townsend. Comment: No doubt crazed by the wild beat of rock n roll, rhythm n blues. In 1950, the Eagle gave a lot of ink to Dolphin when he opened his shop, but the amount of coverage seemed to relax as the Dolphin advertising budget slacked off. After this fine two-label release stiffed, The Passions were laid off to the Era sister label of Dore, after the cousins who ran Era, broke their partnership for the less effective “Tango Of Love” b/w “Nervous About Sally” (505) in 1958. In 1959, most likely because of a competing East Coast Passions group, which had hit big with “Just To Be With You,” they became the Colognes on Lummtone, after which Sinclair and DeVase joined the Elements/Elgins vocal group. Townsend’s powerful ballad, “For Your Love” b/w “Over And Over Again” (3926) was his breakout local and national success, hitting top 15 nationally and top 10 in L.A. and on border radio. Kell Osborne arrived in L.A. in 1959 from Detroit where he had moved with future members of the Temptations. About his disc debut, “Bells Of St. Mary” b/w “That’s All Right Baby” on Trey (3006), Osborne said, “I didn’t like that too much. Phil Spector was very young, great guitar player and was easy to work with, but he was so young, hadn’t made any hits yet. I was the first artist he got a hold of. After he became famous, he wouldn’t speak to me. Among other singers, Osborne recalled “Lester had Bobby Sheen also.” In 1963, “The Bells Of St. Mary” was given to Sheen’s Bob B. Soxx and the Blue Jeans, also produced by Spector. The Elements, Kenny Sinclair, Darryl “Cappy” Lewis, his brother Carl Lewis and Jimmy Smith emerged from the Six Teens with William DeVase, who had sung with Sinclair in the Colognes on Lummtone, also known as the Passions on Era and Capitol. Their only release, the fine “Lonely Hearts Club” b/w “Bad Man” came out on Titan (1708) in 1960. A Beaumont, TX classmate of Smith from Texas, Oscar McDonald replaced Carl Lewis and the group moved on to the Flip, the original home of the Six Teens as the Elgins. After a one-disc career as the Elements on Titan, the newly renamed Elgins put down one historic 45 for Flip, “Uncle Sam’s Man” b/w “Casey Cop” (353) in 1960. This tearful goodbye-to-a-serviceman’s sweetheart as he heads off to sea was patterned by Darryl Lewis from the bridge (“darling can’t you see that I’m going overseas”) of the Six Teens’ major Flip label hit, “A Casual Look” (315) from 1956. The Elgins’ presentation featured strong unison harmonies overlaid with Jimmy Smith’s impassioned lead and soaring falsetto. “It’s what you call a weave, doing falsetto over the top, dropping back into the harmony, back to the lead,” said Smith. “It was a different thing.” For their next releases, the Elgins moved over to the Lummtone label in 1961.